After all the fears expressed before the Pope left Rome of a possible debacle - street protests and a poor turnout - there was a tangible sense of relief, even of euphoria, among Pope Benedict's entourage during the return flight to Rome from Birmingham. As the Pope and his cardinals dined in their chartered Alitalia Airbus (on pate de foie gras, pasta with egg plant, cold meats, cheese and wild fruit tart) the Vatican entourage were enthusiastic about the results of the four-day trip. Their excitement was echoed by Prime Minister David Cameron in an unexpected accolade as he bade farewell to the Pope at the airport. Mr Cameron said the Pope had challenged the whole country "to sit up and think" about the relative roles of religion and politics. Does Mr Cameron's vision of a British "Big Society" coincide with the social teaching of the Roman Catholic Church? Surprisingly, there seem to be many points in common. The Pope had talked about "the development of a healthy pluralistic society". He expressed his admiration for Britain's "instinct for moderation" which found an echo in the prime minister's vision of a country that is "deeply but quietly compassionate". 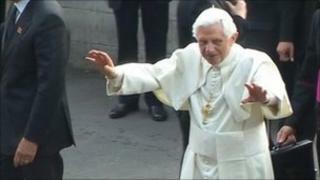 Father Federico Lombardi, the Pope's official spokesman, described the visit as "wonderful". The big crowds that gathered along The Mall in central London on Saturday afternoon to greet Pope Benedict on his way to the Hyde Park prayer vigil had been impressive, by any royal standards. But it was not the size of the crowds that impressed the Pope so much as the fact that so many people were listening to his speeches, most of which were broadcast live on TV. They understood with their hearts and minds, Father Lombardi said. Although the visit overall may have lacked the panache of a British royal event, the Pope's tour developed a momentum of its own from the moment he was welcomed by the Queen in her Edinburgh palace of Holyroodhouse, with all its memories of the unfortunate Catholic monarch Mary Queen of Scots. In Rome, we are used to seeing the Pope kissing and blessing babies held up to him as he tours around the crowds during general audiences. But in the eyes of British people he was certainly humanised by the media during his visit, even being photographed patting a police sniffer dog as he lined up for a souvenir photograph with a small group of the 2,000 policemen and women who have been in charge of his security. A pope who had previously been regarded as someone rather cold, professorial, aloof and authoritarian; had suddenly been perceived as a rather kindly and gentle grandfather figure. Throughout the trip, I was a member of the Vatican Accredited Media Personnel (because of the acronym that appeared on our press passes, we quickly became known as the Vamp) which accompanied Pope Benedict. Italian journalists travelling with the Vamp seemed surprised at the orderly way in which the 10,000 street demonstrators against the papal visit had marched in London on Saturday "without a whiff of tear gas being shed". But Marco Politi, a veteran Vatican reporter, noted that although the Pope commiserated with five carefully selected British victims of clerical sexual abuse in the chapel at the Nunciature in Twickenham, some victims had refused the Vatican offer to meet the Pontiff as they had actually been abused on church premises. The Pope's triumph was really his speech to leaders of civil society at Westminster. One political mover and shaker told me afterwards his performance had been "sheer magic". Within the space of two hours Pope Benedict penetrated the heart of the Anglican Establishment. In Lambeth Palace, Westminster Hall and the Abbey, he delivered a rather flattering tribute to what he found attractive about British culture and traditions. I watched it all from a sort of BBC transparent bubble - a TV studio which had been hoisted on a crane high onto the roof of the Methodist Central Hall, giving us unprecedented views of the great West Door of the Coronation Abbey and the London landscape. I reflected that travelling around Britain inside the papal bubble does give one a unique bird's eye view of contemporary British society. How much the Pope actually observed for himself as he travelled from Edinburgh to Glasgow and on to London and Birmingham I do not know, but this journey did also cause me to "sit up and think" about how stereotyped the view of the Vatican from afar can become.